Alien Day online fan celebration! Alien Mini Epics and More! Monsterpalooza licensed Alien print here! 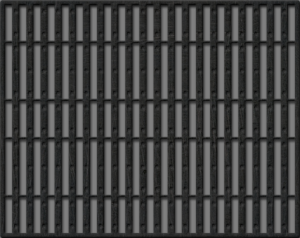 Plenty of new product announcements at the official site! New licensed prints and merch in the UK at Fanattik! Diamond Select alien head letter opener! Dark Horse's Dead Orbit HC! Dark Ink Art prints and pins! Stunning life size alien figure from LeBanni! Fun stuff at the Fox store! Jake Busey talks The Predator! New ReAction Figures and More! NECA figures at Big Bad Toy Store! NECA Alien 3 creature pack! Noomi Rapace's Original Role in Alien: Covenant Revealed! Why Alien is a Timeless Masterpiece! Dr Alien, PhD: the horror classic that academia loves! AvP Arcade Hunter Predator Action Figure! Preorder Aliens ReAction figures at Monsters in Motion! New Action Figure Releases and More! Abandoned Alien vs. Predator football video game concept! Alien 40th Anniversary short films! New Hiya Toys Predator figure! Rare model kits for sale at Monsters in Motion including an Alien3 Dog Burster, a classic Alien Xenomorph, a Billikin Predator! a vision models Predator, and more! Amazing Alien & Predator collection! NECA Alien & Predator classics! Making the Alien: Isolation digital series! Tom Skerritt talks Alien at 40! Alien & Predator merch at Toy Fair! 13" Sulaco Model kit at Monsters in Motion! Alien & Predator 6" Classics at Monsters in Motion! "King Size" Alien Sofubi from Medicom! Narcissus model kit at Monsters in Motion! Alien author Alan Dean Foster interview! Aliens Series 13 photo shoot! NECA Predator Fugitive Lab Escape! Funko Alien 40th Xenomorph & Ripley with Tracker Vynl! Funko Alien 40th Xenomorph Pop! Vinyl Figure! Funko Alien 40th Ripley in Spacesuit Pop! Vinyl Figure! Funko Alien 40th Xenomorph Pocket Pop! Key Chain! NECA Predator Ultimate Golden Angel 7-Inch Scale Action Figure! Super7 Aliens 18-Inch Alien Warrior Bronze Action Figure! HIYA Toys Alien Covenant Figures! StudioADI AvP behind the scenes! Memory: Origins of Alien Reviewed! Predator 2 Blind Box Figures & more! Including Keyes, Harrigan, and King Willie! NECA Alien: Resurrection and more here! Mondo free pin with t-shirt promotion! Making of Alien "Memory" review! The Predator Bonus Features & more! Collider checks out The Predator's Blu-ray bonus features! Cool, clear 1:4 scale alien head! The Making of Alien at Monsters in Motion! New Aliens Board Game & more! 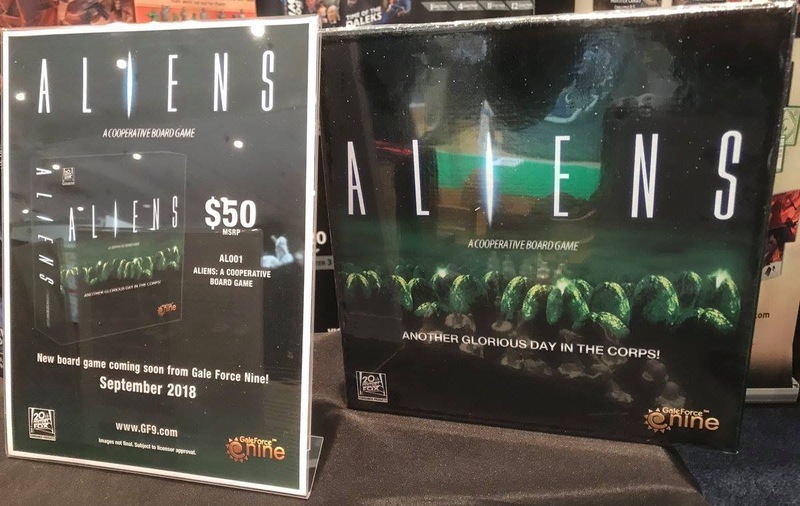 New details on Gale Force 9's Aliens board game! ADI sculpting the fugitive Predator! Fun Benedict Woodhead alternative Alien art print! AvP Galaxy with a review roundup for ALIEN: Blackout! New ALIEN documentary & more! New documentary on the making of ALIEN! More info on the mobile game ALIEN: Blackout! NECA Bad Blood Predator photo shoot! Aliens: Hadley's Hope board game! NECA teases Kenner Drake tribute figure, Thermal Vision Predator, and more! $5 Funko Rock Candy Ellen Ripley! Amazing NECA Aliens visual guide hi-res download! Thermal Video Predator first look! Infinite Earths reviews Dark Horses's Alien 3 issue 2! ADI shares a behind-the-scenes look at the Predator's menagerie! AvP Galaxy shares concept art from the Predator! Video review of Cool Props 1:3 scale Giger Alien maquette! NECA Predator Bad Blood vs. The Enforcer 7" 2-pack! Casey Callendar Predator art print! $75 off HCG Chestburster with code "Chestburst 10"! Amazing Cool Props Predator busts! Johnnie Christmas talks adapting Alien 3! XM Studios stunning Predator collectible! Ahriman Burke & Facehugger anime art! Cool Props 1:3 Alien Warrior statue! Cool Props Aliens Queen maquette! More Cool Props reveals on Instagram here! Prime 1 Studio Scorpion Alien and Cracked Tusk Predator statues here! 1:4 scale Fugitive Predator here! Several new HIYA Toys Alien and Predator figures available for pre-order! NECA Ultimate Aliens Warrior figure! Mondo Florian Bertmer Alien poster! The Predator Lego Style helicopter set! The Predator Lego Style M18 Vehicle! Bob Burns' Burbank Alien Halloween! Bottleneck Gallery Matt Ferguson Predator 2 print! Rare Alien Xenomorph model kit here! Exclusive "Jonesy" toy at NYCC! Emissary Predators cut from the Predator! SH Monsterarts Big Chap here! Predator at Big Bad Toy Store! The Making of Alien: Resurrection for PS One! Dark Horse's William Gibson's Alien 3 contest from Johnnie Christmas! NECA Ultimate Alien Warriors packaging reveals! Prime 1 Alien wall art! Xenomorph Big Chap wall art! Eaglemoss Alien Warrant Officer Ripley! NECA Predators figures and more! Spanish Alien Collectors Blu ray! A history of Drak Horse's Predator universe! Top 10 NECA Predator figures! NECA Rick Hawkins figure review! Sideshow Alien Big Chap statue! Alien & Predator Lego movie figures! New making of Alien documentary, Memory the Origins of Alien! Amazing XM Studios Alien Diorama! One Ugly Mother Predator retrospective! Alien foam Space Jockey replica! Hiya Toys Predator, Covenant & more! The Predator Fugitive figure bust! Pre-order William Gibson's Alien 3 here! A cool history of unproduced Alien figures! ADI shares some behind the scenes on Alien 3! Johnnie Christmas teases Alien 3! AvP Galaxy with The Predator coverage! The Predator figure bust preview! More new Eaglemoss Alien figures! Some great new Alien and Aliens shirts from Fright Rags! How Alien: Isolation's retro space station was built with fear in mind! Michael Biehn Far Cry 3! Predator 2 behind the scenes! Alien: Origins The Real Name for the Xenomorph Explained! Alien: Covenant Neomorph life-sized head! Coming soon from Cool Props! Xenomorphus Rex model kit at Monsters in Motion! NECA foam replicas at Big Bad Toy Store here! Prime1 Alien 3 exhibit! Thanks Marco! Predator 4k Ultra review roundup! Papercraft Alien models at Jim Smash! Xenomorph Madballs at Big Bad Toy Store! Pixel Dan video coverage of NECA at Comic-Con! This Eviscerated Bishop really ties the room together! NECA Kenner Drake and more! AvP Galaxy covers The Predator at Comic-Con! Stunning Hollywood Collectibles lifesize Alien Big Chap! More coverage of The Predator at Comic-Con! And more The Predator at Comic-Con! ToyArk has an impressive photo gallery featuring NECA's Comic-Con Hawkins figure! ALIENS: Colonial Marines xenos get a lot smarter by fixing one misspelling! How a Typo Screwed Up One Of History's Worst Video Games! ALIENS: Colonial Marines What Went Wrong? The Predator making of and art book! The Predator Ultimate Fugitive figure! Nerdist takes a look at NECA's Hawkins SDCC exclusive! Stunning 1:3 scale Mamegyorai Big Chap statue! The Secret History of William Gibson's Alien III script! A visit to Alien: Covenant's Odd Studio! Dark Horse adapting Willam Gibson's Alien III! The Predator Funko Pop! selection! Alien Covenant bust bank at Monsters in Motion! More Alien at Big Bad Toy Store! Alien goodies at Think Geek! Alien Warrior megabox at Big Bad Toy Store! A fun look at Alien: Resurrection on set arcade game! NECA Ultimate Fugitive Predator figure! AvP Galaxy takes a look at Bad Blood Predators! Obsidian director talks cancelled rpg game! Alien props fetch big bucks! New "The Predator" images released! AvP Galaxy on Empire's "The Predator" coverage! James Cameron answers sci-fi questions! New Predator figures at Big Bad Toy Store! Fox Alien short film competition! The Rundown with Bill Duke and The Predator footage! The Predator to invade Comic-Con! Bill Sienkiewicz Dog Alien art! Eaglemoss Alien Predator Tusk Xenomorph from AVP Statue with Collector Magazine #40! Alien props sell for big bucks! A Tiger in the Office: How Alien Isolation's Xenomorph Took Shape. Burke and more from Eaglemoss! Hero Complex Gallery has two new Aliens art prints available here and a "Blacklight Variant" here! Better quality The Predator trailer! Figma Predator Takayuki Takeya Version Action Figure! USS Sulaco art print collection! Predator throne action figure accessory! Gale Force Nine Aliens board game! "8 Bit Horror" Funko Pop! NECA San Diego Comic-Con exclusive Predator Hawkins figure! "Superior Firepower" Pulse Rifle pin! Aliens vs. Predator Medicom limited edition! AvP Galaxy with the latest from Prodos Games! Eaglemoss Dr. Gediman from Alien: Resurrection! The Predator set visit with Shane Black! 60 things to know about The Predator! Alien ring collection! NECA Series 11 blue Alien Warrior! Visiting the set of The Predator! Rare Xenomorphus Rez model kit! New Hiya Toys Predator figures at Big Bad Toy Store! Shane Black on The Predator! Visiting the set of The Predator! Veronica Cartwright talks Alien! Aliens Ripley Rock Candy figure! Rare Kaiyodo Aliens 1:9 scale kit! New Dark Horse Predator comics! Entertainment Weekly has a preview of Cameron concept art! NECA Alien: Resurrection figures in 2019! Aliens' Original SFX Artists Helped Sideshow Create the Most Accurate Alien Queen Collectible Ever! Hollywood Collectibles Alien Covenant Xenomorph 1:4 Scale Statue! Also available at Entertainment Earth! Aliens: Dust to Dust review round up! Jonesy: Nine Lives on the Nostromo! Fun A L I E N: Garbage Day video! "Jonesy" book coming from Titan Books! New "David 8" art book! AvP Galaxy Alien Day coverage! 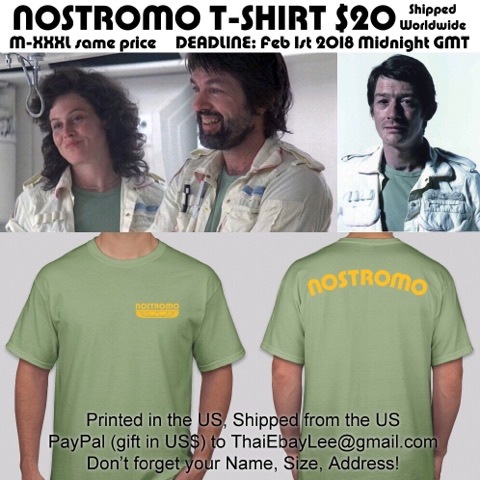 Alien Day podcast and t-shirts! Alien 3 soundtrack from LaLaLand! Alien Video Game POP exclusive! Dark Horse teases something new! Last Exit to Nowhere Alien shirts and more! New BeastWreck goodies on sale tonight at midnight! Dark Horse Alien Day mega bundle! Aliens: Dust to Dust review 1! Aliens: Dust to Dust review 2! Aliens: Dust to Dust trailer! SH MonsterArts Big Chap at Entertainment Earth! SuperFans Group Alien Wall Sculpture! Predator Glow in the Dark Dorbz! Cool pins from theater of creeps! Alien Day Sale at Hollywood Collectibles! Join the Eaglemoss Alien Day Ultimate Giveaway and win one of over 200 prizes! AvP Whoever Wins Collection Display Case! Aliens 36" Alien Skull Prop Replica! Unique Alien custom art toy! Vulture Beat takes a look at A L I E N: Descent! LaLa Land Records teases Alien Day release! New Eaglemoss Alien figures including Resurrection Ripley! More on the Alien Descent VR Experience! New Aliens Hive wall sculpture! Prime 1 Studios dog alien! Alien Day exclusive t-shirts with free comic at Fox! Lego Alien Alien Day preview video! Make an Aliens Facehugger stasis tube! Prime 1 Studios dog alien at WonderFestival! Fright Rags A L I E N Ben Cooper mini mask! More on A L I E N the board game! More on Blomkamp and Alien 5 at JoBlo! Aliens: Dust to Dust cover preview! Aliens Action Vinyls at Big Bad Toy Store! 18" Retro Style Aliens Warrior figure in black, green, and prototype colorways! Stan Winston School student spotlight! Figma Alien coverage at Toy Ark! NECA Alien series 13 at EE! Alien 3 "I was there!" Exclusive "Glow in the Dark" Predator Dorbz at Entertainment Earth! of their upcoming Alien figure! Alien: Covenant 2 CD soundtrack! YouTube video exploring the Space Jockey's origins! Eaglemoss is giving away over 200 Alien and Predator prizes as part of their official Alien Day celebration! Click here for more info! Aliens Dust to Dust preview! Hiya Toys Predator 2 figure review! Infinite Earth's talks to Aliens: Dust to Dust artist Gabriel Hardman! The Art & Making of The Predator! Alien Egg salt and pepper shaker! Audio interview with Carrie Henn, Ricco Ross, and Jenette Goldstein! Available at HCG and The Big Bad Toy Store! Aliens: Dead Orbit trade paperback! Weaver & Paxton talk Aliens! Aliens 30th Anniversary at Comic-Con! Alternate Alien: Covenant prologue at Screenrant! Monster Legacy looks at Alien: Covenant here and here! Why Alien: Isolation Is One Of The Best Alien Sequels. Super7 has just released Series 2 of their Alien Blind Box assortment! AvP Galaxy has the scoop on The Art & Making of The Predator! Original Dog Alien on display at Fox! Alien Egg light up statue! Eaglemoss Mega Xenomorph Warrior and more at Big Bad Toy Store! Resin Realities Giger Alien kit! Hiya Toys City Hunter & Guardian figure reviews! Alien: Covenant "flashback" visual effects sequence! Alien: Covenant set construction timelapse! Alan Ladd, Jr. talks Alien and more! Alien: Covenant visual fx breakdown! Alien: Covenant behind the scenes! Super 7 Alien goodies at Toy Fair! How Alien changes the way Hollywood scares us! New NECA Alien & Predator figures at Big Bad Toy Store! New "The Predator" movie figure at Monsters in Motion! Predator 2 Golden Elder Predator figure! Section 9 lifesize Alien: Covenant warrior! Free shipping on NECA Predator 2-Pack! Alien: Covenant Funko POPS on sale! AvP Galaxy has some great pics from this year's Toy Fair! New ReAction Nostromo crew figures! Lootcrate's exclusive "Queen Takes Bishop" figure is now on sale! Hiya Toys at Entertainment Earth! Alec Gillis has posted a unique look at Bishop from Alien 3 on instagram! Ridley Scott's Alien Nothing Is as Terrifying as the Fear of the Unknown! Tom Woodruff, Jr. and the Alien Queen! Alien busts and more at Big Bad Toy Store! Alien: Covenant Xenomorph bust bank! Pre-order Alien items at Westfield Comics! Alien skull foam prop replica! Click here to let him know if you're interested! Cool Props Queen Maquette here! More versions at their site here! New Alien video game in the works! Dark Horse Aliens: Dust to Dust! Alien Xenomorph Blood Splattered 8-Bit Pop! Vinyl Figure! High quality replacement wheels for Halcyon's APC! Podcast interview Interview with Alec Gillis and Tom Woodruff, Jr. of Amalgamated Dynamics! Galactic Resin APC model kit! Eaglemoss Bull & Gorilla figures at Entertainment Earth! Creating monsters for Alien: Covenant! Seeing the 60s and 70s through Alien and 2001! Nerdist looks at Alien blood science! Cool Props lifesize Alien head! 6 Things Alien Franchise Characters Do That Get Them Killed! A L I E N deleted scenese! More new Eaglemoss figures at Big Bad Toy Store! Fun "alternate reality" Alien kids books! Since this main page was getting too long to the point of absurdity, we finally decided to stop being lazy and move all the older news to an archive section here! John McTiernan Predator art prints at HCG! Preorder Eaglemoss' Aliens Ripley and more here! Sign up for Studio ADI's newsletter here! A L I E N the blueprints! MONDO Predator print from artist MC Winters! Predator & John McTiernan retrospective!